Steel-Tech coatings contain 316L stainless steel for superior durability, according to the company. Available in epoxy and polyurethane finishes and dry to a metallic gray. According to the company, only one coat is required and the finish is quick-drying. Epoxy finish is designed for severe environments and can be applied without a primer. 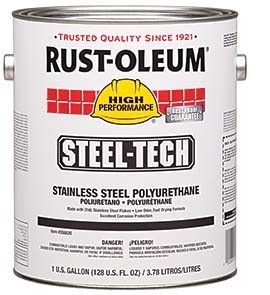 Polyurethane finish can be applied directly to metal, clean steel or tightly adhered rust without a primer.